Navratri Festival - Learn About Festivals in Kerala. The Navratri celebration is known by different names in different parts of India. It is Durga Puja of Bengal, Dussehra of Bombay and the Saraswati Puja and the Ayudha Puja of the south. Literally Navarathri means 'Nine nights'. This festival is celebrated over nine days in Kanni (Sep-Oct) and culmination on Vijayadasami, in which God is worshiped in the form of Mother. This is a period of introspection and purification. Navratri is traditionally an auspicious time for starting new ventures. During this period, Durga, Lakshmi and Saraswati are worshipped as three different manifestations of Shakti or Cosmic energy. The last three days of Navratri are most important. The last three days are known as Durga Ashtami, Mahanavami, and Vijaya Dasami. On the night of the Durga Ashtami day, there is the ceremony known as 'Puja Vayppu'. It involves decorating a room superbly, illuminating it with many lights and arranging on a platform, raised in the middle of the room, the things necessary for performing Saraswati Puja. During the last three days of Puja, all sorts of learning and business come to a stand still. This festival is also celebrated for Navagraha Naayagi (Nine nymphs). It is called by different names in different parts of India. In Karnataka, it is called Dasara, in Bengal - Kali Pooja and in this state it is known as Saraswathy Pooja. Saraswathy is known as goddess of Knowledge. On this day all tools and books are kept for Pooja. This festival in honour of Devi (Goddess) the Divine Mother is celebrated across the nation. Durgashtami day, is the day of Ayudya Puja. Poojavaipu (the ritual offering) is performed in the evening in temples and houses.It signifies the beginning of formal education for every child aged 3-5 years. Custom dictates that no tools be used on this day. Books and other tools of education are offered to the goddess to be blessed. According to Hindu mythology, Saraswathi is the goddess of learning and this annual offering will invoke blessings for one's progress.On navami, day, Goddess Saraswati is honored by worshiping the books and records at home.Thousands throng the Saraswati temple at Kottayam during this period to take a dip in the mysterious holy pond whose source is yet unknown. Large gatherings are also seen at the famous temples at Thekkegram (Palghat), in which there are no idols -- only huge mirrors. A devotee finds himself bowing before his own reflection which indicates that God is within us. Thrikkavu Temple, a famous Durga Devi Temple at Ponnani, Malapuram Distric of Kerala in India is also famous for Navarathri festival and vidyarambham(begining of formal education). Thousands of children throng this temple on vijaya desami day for vidyarambham. Vidyarambham is done either when the child reaches three or five years old. On the tongue of the child the letters "Hari Sri Ganapataye Namah Avignamastu "and all the alphabets are written with a piece of gold. The child is made to write the same letters from "Hari Sri" onwards with its ring finger on raw rice in a bell metal vessel and the child is made to utter each word when it is written. Either the father of the child or an eminent teacher officiates at this ritual. There are also centres which are noted for the ceremony like 'Thuncham parambu' in Malppuram district. On Vijayadasami day during Dussera celebrations, a lot of children get initiated in the learning in temples dedicated to Saraswati, the goddess of wisdom and learning. On Mahanavami day all work and learning are suspended. 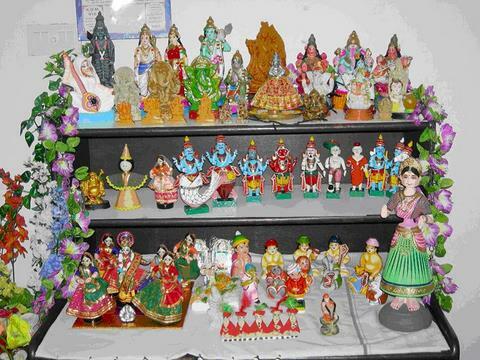 On Vijayadasami day, the books and tools are taken back by a ceremony called Poojayeduppu. Vijayadasami day is considered to be most auspicious for new ventures. Little children are initiated into the world of letters by elderly persons on this day. In most of the temples dedicated to Devi, the Divine Mother, cultural programmes and Navratri Pooja are conducted during these days.